DELLOW Mk1 (Prototype)...Dellow Motors Ltd in Alvechurch near Birmingham was launched by Ken Delingpole & Ron Lowe specifically to produce a road-going sports cars for the enthusiast to use on trials, rallies and hillclimbs with many sporting awards won in the 1940s & 1950s, Dellows even took overall honours in the MCC organised Daily Express National Rally & the Circuit of Ireland Rally against mighty opposition - Dellows were designed for one purpose only - competition work & and they are still used competitively today ! A very early example indeed, CAB 282 being one of only two survivors of the four original prototypes – Only this car & EDE 384 still exist ! 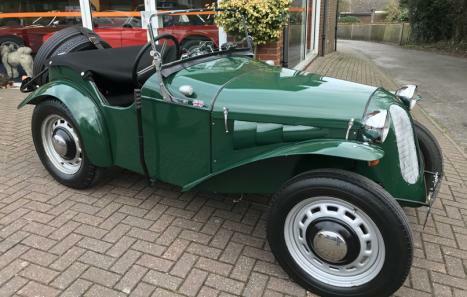 Specially built for Lewis Tracey, an active member of SUNBAC, Hagley and District Light Car Club, Steering Wheel Club London & the British Trials Driver Association, as with the first handful of Dellows. CAB 282 this car still retains its Austin 7 chassis, Aluminium body, Equipped with Ford's 100E 1172cc side-valve engine, Period twin downdraft Solex carburettors, Aquaplane inlet manifold, Four branch exhaust manifold, 3-speed gearbox, External fiddle brake, Umbrella handbrake, Mohair tonneau cover. 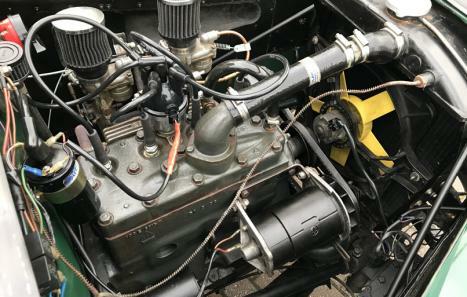 CAB 282 enjoyed a very active & successful competition life including circuit racing, hill climbs and trials becoming a multi award winning car along the way. 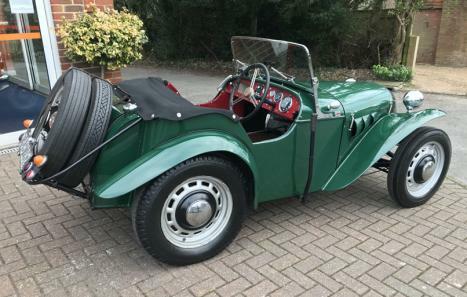 In 1949 the earlier prototype panel work was remodelled by coachbuilder Lionel Evans of Radpanels (who built all the bodywork for Dellow motors). Eventually CAB 282 was sold & remained in the Birmingham area until the 1960’s when it was bought by a Chelsea based gentleman. Dellow registrar Peter Seabrook-Harris purchased CAB 282 in 1977 in a dry stored but derelict state but with all the key fittings intact and remarkably the original Sunbac badge still fixed to dash ! CAB 282 has been subject to a total nut & bolt restoration completed in 2010, CAB 282 has an incredible fascinating provenance file confirming its provenance & competition history (Trails, Speed events, Circuit racing & Hill climbs), Remarkably an incredible archive of original period photographs dating back to 1947& even film footage showing her on the 1948 Gloucester Trial still exists ! (https://www.youtube.com/watch?v=8YLmb08T0z4), CAB 282 was featured on the front cover of 17th November 1950 Autosport Magazine and more recently by Michael Ware in ‘The Automobile’. 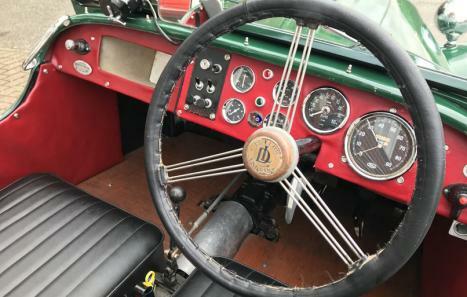 A historically significant car, CAB 282 is probably the most well-documented Dellow known & would be enormously well-received at any historic event, A special example indeed.